We have a running joke at our home that if I paint something any color besides white, it will eventually get repainted and will end up being white or some neutral color. Well, I thought I would surely never paint this cabinet any color but green. Well, I was wrong. Old farmhouse style furniture has a way of luring me in. I love the simple straight lines of old shaker style pieces and I recently was browsing the a local for sale site when this beautiful farmhouse cupboard showed up. Would you love to always have a clean kitchen? I personally love having a clean kitchen and today, I share my tips on ways that I manage to have a clean, neat and tidy kitchen throughout the day. Ever have those days you feel like you spend most of the day in the kitchen? Cooking and cleaning are two of the most time consuming parts of my day. With a large family I work to keep a kitchen that is functional and minimal but I also want a beautiful space to work in with quality products. I’m here to help you get the farmhouse look you love at prices you can hopefully afford. I have done the shopping for you and guess what? So many of the products that I love come from small shops. How amazing is that? There is just something that I love about getting a product from another small shop that is lovingly made with time and effort. You ready to see some of my favorite finds? Let's go shopping together! Mason jars, white dishes and cast iron skillets are essentials in my kitchen. Mason jars make the perfect drinking glasses for our family and they also serve as a way to store leftovers in the fridge. When I cook soups or chili I often make extra for the next day. Simply place the cooled leftovers in a jar, put the lid on and stick in the fridge. The next day it is easy to grab and reheat for another meal. Mason jars seem to be the most non breakable glasses that we have ever used and the price of $9.00 for 12 is quite a deal. Lodge cast iron is the most used cookware in my kitchen. There are so benefits to using cast iron and they are extremely easy to care for. A well seasoned cast iron skillet is naturally non stick which means no harmful synthetic materials being leaked into your food. We often serve our food still in the skillet at the table and cast iron helps by keeping the food warmer longer than your traditional skillets. Cast iron is long lasting and versatile when it comes to cooking most of the foods we love. Wooden spoons seem to be a farmhouse style favorite. They are functional and beautiful to leave in a crock on the cabinet. One of my favorite small shops for hand made wooden spoons and cutting boards is We Are Caribou. I have enjoyed having their products in our home and I can honestly say that they are a great quality. Crocks are another farmhouse kitchen staple for my home. They are used in the kitchen to store my wooden spoons, measuring spoons and sometimes even fresh flowers. We have crocks in our living room cabinet that holds crayons and other school supplies. I love an item that keeps some of supplies hidden and yet pretty. Most of my smaller crocks have come from Cynthia who has a lovely online shop called Harper and Arrow Market. Crocks can also be found at thrift stores and yard sales. Linen dish towels. I have made the switch to 100% linen in my kitchen and I didn't realize all the wonderful things about a quality linen towel until I started using them. Did you know that linen is up to two to three times stronger than cotton? It is even stronger when wet and yet it softens with repeated washings. Linen is also lint free which is perfect for drying glasses. Linen is also naturally anti bacterial. Hanging on a hook, or placed in a basket, linen is always a lovely choice for the kitchen. Would you believe that we don't own a dishwasher? Our home had one when we first moved in but I chose to take it out. We wash dishes after every meal in order to help keep the kitchen clean through out the day. I find that the dishes can be hand washed, dried and put away faster than using the dishwasher and it saves electricity. I currently use a wood dish drying rack that I picked up cheap from a local store but I would love to find a better quality, better made drying rack that is made in the USA. Do you know a good source? If so, leave me a comment. Glass jars and hand written labels have been a favorite in my kitchen. I love having the jars filled with the most used kitchen staples. I can easily see what needs to be purchased and rarely ever run out of anything. These jars do not seal and so that is the only downfall to having them if your a family that wouldn't use the ingredients in them very often. With a large family I don't ever have an issue with food going stale but I have recently decided that I would like to store some less used dry goods in jars. So, I am on the lookout for a great jar that does seal. Leave me a comment if you have a favorite jar that seals. *I have since updated my jars. Click here to read about that. What are some of your favorite kitchen items that you love using? Are you a supporter of small shops and have one you would love to share? I would love to hear from you! The kitchen in our double wide is a good size. That is one of the things that sold me on this home. There were plenty of cabinets and that was important for this family of 6. The former owners never cleaned or so it seemed which means that I had a lot of scrubbing to do in order to even think about moving in. This photo below was taken after some much needed cleaning and before we took out the fridge that they left full of rotten food. YUCK! The former owners apparently thought that the fluorescent lights on the ceiling would be a great touch and those were one of the first items removed from the home after the nasty fridge. The wallpaper was not lovely in the slightest way. Torn, ripped and stained I simply painted over the top of it. This is a current view of our space. This past fall I took all the upper cabinets down and added the DIY shelf for all my jars. I never got around to doing a wall treatment or even painting over the fridge. I am glad that I didn't now that this entire wall will be transformed within the next 8 weeks. The only thing that will be staying at this point is the kitchen island. I love the function of this piece and the storage that it provides for our space. Stay tuned as demo starts soon! Last year I started clearing out items in our home that we really didn't use and one of the areas that I try and keep clutter free is our kitchen and dining room area. How many of you know someone that keeps all those plastic grocery sacks or even those plastic containers that used to hold food? Maybe that is you and your mind set is that you will eventually use those items one day. When will that day come? Yes, you many eventually use one or two of the items that you have stored but what about the space it consumes in your cabinets? I am not one of those who keeps all those extras around because all the various kinds of clutter makes it harder to keep a clean home and to keep our home organized. Our island is the hub of the kitchen. All of our dishes that are used on a daily basis are stored in this area. There are several ways that our family of six functions in our home so that the kitchen stays clean throughout the day and the counters remain clutter free. 1. Each child has their own cup. This saves on a lot of dishes because they use their cup throughout the day and at the end of the night it gets washed and dried to be used the next day. 2. We do the dishes after every meal. With a larger family it would be easy to get very overwhelmed if we did the dishes only once a day. We do not own a dishwasher and so all dishes are hand washed. Not owning a dishwasher was a personal choice because we actually had one in our home and I opted to have it taken out. I found that I could wash the dishes, dry and put them away faster than I could load and unload the dishwasher and it saves on electricity. 3. Many hands make light work. Each child helps in some way after meals with clean up. It may be as simple as putting food away, helping wash dishes or clearing off the table. I love our kitchen island and how that even our youngest daughter who is 7 can help put things away. Having the island open with all the dishes visible is also a great way to ensure that items stay organized and looking pretty. Our kitchen island was a find off of a local Facebook for sale site. I wish I had the original photo because this was stained a terrible orange color and didn't have the shelves on the inside or the trim around the edges. I added the trim, shelves and painted it white. I often wonder how I lived without such a functioning piece in our home. As a mother I cook a lot. It seems like I finish one meal and they are ready for a snack or hungry again in such a short amount of time. That all comes with being a mother, right? One of my favorite areas in our home is the open shelving for all those items that I use a lot. I love having everything visible and can easily identify if I am about out of certain staple in our home. This is an easy way to keep all of my basic baking needs easily available. As we continue to remodel our home this is one of the areas that will be seeing a change this spring. These cabinets are original to the home and they are so cheap. We currently store all of our groceries in those cabinets. The plan is to rip all of this out and completely enclose the area with sliding barn doors. Once that is done there will be shelving so that all of our grocery items are easily stored. Function meeting beautiful design is something that I am really looking forward to as we prepare to transform this space. This is just a good temporary solution until that happens. One of the most frequent questions I get about the storage jars is about the contents going stale. These jars do not seal but we use the contents quickly enough that I don't have to worry about that. The labels are from a craft store and then I hand wrote the contents. The other side of kitchen island has two rustic style barstools. I often wish I had a bit bigger island as many times all 4 children want to sit here. I think one of the greatest things about this space is the times that I get to be in the kitchen and one of the children is sitting here either helping me or chatting about whatever may be on their mind. I love numbers and you will regularly see them throughout various areas of our home. I painted the numbers 79 and 81 on these barstools and they represent the years that my husband and I were born. Our dining room is very simple. I lean towards a minimalist style but I also believe in surrounding myself with items that I love. I collect Ironstone pitchers and crocks which can be seen on top of the vintage cabinet. The wood crates hold a little more of Ironstone collection. I really love quality items and therefore I have switched over to a lot of 100% linen in our home. 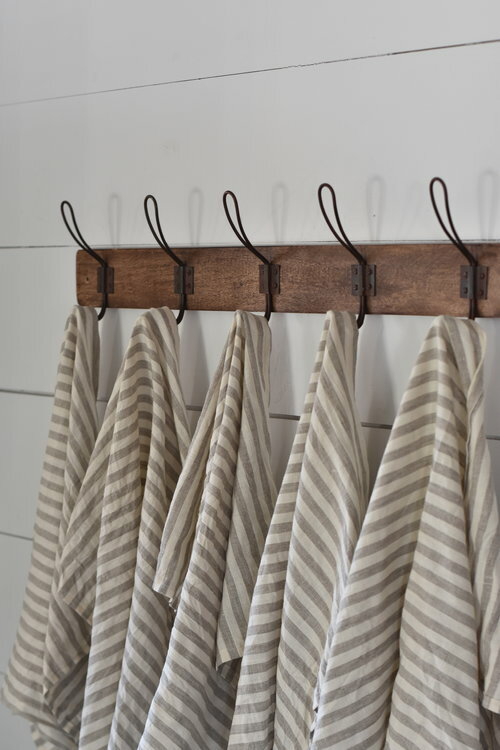 I never knew that linen had so many wonderful qualities such as being naturally anti bacterial so I often have linen towels out on hooks or laying on the shelves. Not only are they pretty but they serve a purpose as well. Cutting boards are another useful item in our kitchen area and they are so pretty hanging on hooks. We use them to not only cut vegetables on but also use them on the table to sit hot pans on. Hanging them keeps them within easy reach and they serve as a decorative accent when not being used. The white and gray striped linen towel is made and sold in my Etsy shop. Our home is a continued work in progress and as we continue to work with a cash only remodel the work can feel so slow. However keeping a clutter free functioning area is important to me as is creating beauty with what you currently have. You don't need a lot to create a warm and inviting space. So much of this space is from antique stores and while I pass up so many items I love because of their high prices I continue to seek out those deals that are to good to pass up. Our kitchen table and chairs is the only items that we purchased brand new other than several of the linen towels and I make most of the ones that we have now. This space has really transformed since we purchased our home. To see more before photos of this space click here.